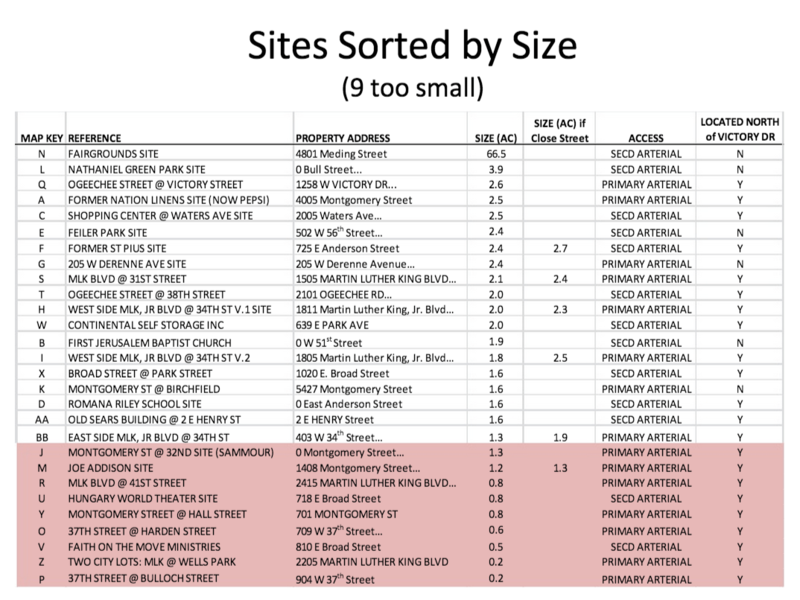 In my sort of obsessively detailed City Talk column today, I continue to look at the city of Savannah’s plan to destroy 36 historic homes facing 33rd and 34th streets between MLK and Montgomery. The site would become the new home of the Central Precinct, which currently occupies a woefully inadequate site on Bull at 31st streets. The homes slated for demolition were built for African-American workers beginning in the 1880s — they are obviously some of the oldest and most historic homes in the neighborhoods south of Forsyth Park. Click here for my last big post on this blog, with various other links. Today’s column, despite all the numbers, has a pretty simple point. The city arbitrarily removed any site with less than 1.6 acres from consideration. That decision was made without consulting city engineers about the feasibility of specific smaller sites. And there is abundant evidence that a smaller site would suffice. The city claims it needs a building with a footprint of 20,000 square feet and 75 parking spaces. The old Sears building site bounded by Henry, Bull, Duffy, and Drayton is exactly 1.6 acres. The Sears site, as currently configured, holds a building with a 28,000 square foot footprint (and about 90,000 total square feet), 106 parking spaces, and space for 25-30 on-street parking spaces. It’s obvious that the station could fit on a smaller site, especially if we take into account potential on-street parking. Click here to view the entire site selection report. There are other elements to this story that I do not address in the column, including the various ways in which a public building with so much parking actually works against the revitalization that the city claims will be encouraged in the neighborhood. I also do not touch on the rather ugly symbolism of all this — of claiming that replacing historic low-income rental properties with a police station is a good way to improve a struggling, largely African-American neighborhood.